You love the ambiance that a couple of well-placed candles can bring to your home décor, however, the idea of the wax getting on the carpet has kept you from enjoying them as much as you’d like. Getting wax out of carpet is relatively simple, and you don’t need to rent specialized equipment to be successful. 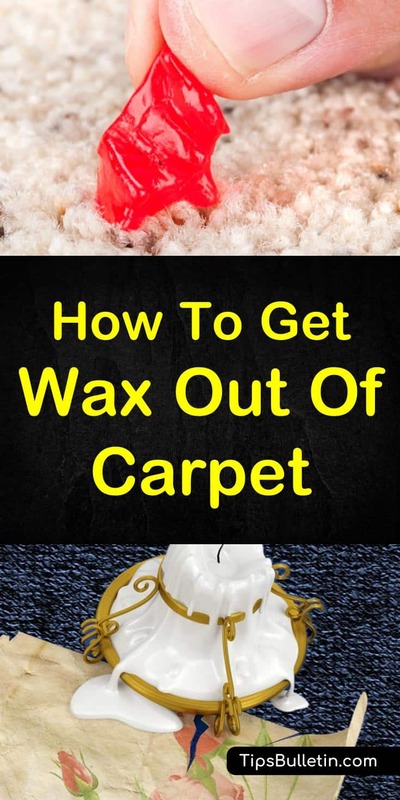 Here are several tips on how to get wax out of a carpet. While flickering candles add a touch of elegance to a dinner party and look romantic on your bedroom nightstand, it’s another story when their melted wax stains your carpet. You don’t have to accept the wax stain as just another problem that you have to cover up, instead, learn how to get wax out of the carpet with these simple techniques. You can use a paper towel to quickly blot up the wax while it is still fresh and warm. Fold the paper towel and place it directly on top of the wet wax. Gently press down on the spot, avoiding wiping or rubbing the spill because this could spread the wax further into the carpet fibers. As you absorb more wax into the paper towel, replace with fresh ones. Continue to blot the area until the wax no longer transfers to the paper. To make wax easier to remove, you can cool it down with an ice cube. Place enough ice cubes in a Ziploc bag to completely cover the wax stain. Seal the bag and put it over the wax for several minutes. Remove the ice and using a butter knife or the bowl of a plastic spoon, gently scrape the wax from the carpet. Using the upholstery attachment on your vacuum cleaner, vacuum up the bits of wax before they become embedded in the carpet fibers. To avoid damaging looped carpet, like Berber, use gentle motions when scraping the wax. Chilling the area with ice cubes and scraping the hardened wax will remove most of the wax, it may not remove candle wax that the fibers of the carpet have partially absorbed. You can get this wax out of the carpet by using a clothing iron and a towel or clean white cloth. Place the material over the wax. Using an iron placed on a low-heat setting without steam, begin to iron the fabric, being sure to move the iron every few seconds. Lift the iron, and if you notice a waxy, wet-looking stain on the material, replace the cloth. This works exactly the same way as when removing wax from fabric. It may take several passes over the area with the iron before you can completely remove the carpet stain. Sometimes the spilled wax, if it’s from a colored candle, will leave a colored stain on the carpet from the dyes that they add to the candle during the creation process. If color remains after you’ve cleaned the wax, you can treat it with a homemade carpet spot cleaner. Before applying any kind of carpet cleaner be sure to test it in an inconspicuous area to check for colorfastness. This wax spot remover is part of our series of homemade rug shampoo recipes. Add the rubbing alcohol and water to a spray bottle. Then add the liquid dish detergent. Replace the lid and shake vigorously to ensure the ingredients are well combined. Spray the carpet stain and allow the cleaning solution to sit for several minutes. With a microfiber cloth, gently blot the area, repeating the process until the stain disappears. Once you eliminate the stain, blot the area dry with a new, clean, microfiber cloth. In my opinion, this simple recipe is the best carpet cleaner solution you can make from home remedies. It works on so many different carpet stains, not just wax, blood or urine. No matter how careful you are with your favorite candles, accidents can happen, leaving unsightly wax drips on your hardwood floor. You can quickly get the candle wax off your floors without damaging them by using these, safe, and chemical-free methods or an easy-to-make DIY floor cleaner. If the wax has a stubborn grip on your hardwood floors, you can use the heat from your hairdryer to remove the wax. With the hairdryer, set on low heat, hold it about 6 inches from the wax spill. Remember to move the hairdryer around a bit to avoid the area from becoming overheated. Next, use a lint-free cloth to absorb the wax. If the wax isn’t melting, adjust the heat on the hairdryer and try again. Continue to heat and blot the area until you remove all the wax. This is also how to get wax off laminate floor or synthetic flooring. For more see our tricks on how do you clean laminate flooring. After the wax has cooled, you can use a dull knife, or your fingernail to scrape the wax off your floor. Be sure not to rub too vigorously as you don’t want to damage your floors. You can clean up any remaining wax or oily spots by combining one cup of water and one cup of white vinegar. Apply the solution to a lint-free cloth. Wring out the excess liquid and gently rub the affected area with the solution. You no longer have to keep your candles locked away for fear of dripping candle wax on your carpet. With these easy tips and techniques, you can remove spilled candle wax from your carpet and floors with ease. If you find you’ve also spilled wax on your favorite shirt, you can read our article on how to get wax out of fabric here. 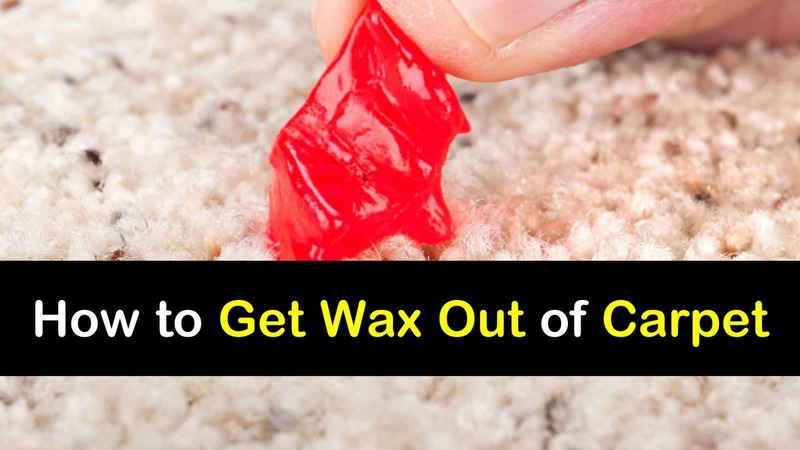 We hope you enjoyed learning how to get wax out of carpet and use these simple methods to eliminate unsightly candle wax spills from your floors. If you found this information useful, it would be great if you could pass these wax cleaning tips on to your family and friends.